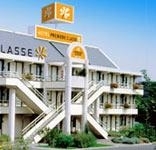 If you wish to book a room at an affordable rate in Agen, choose the Première Classe Agen Hotel. Book your hotel now on the official website and discover the best reduced rates! Using the downloadable HotelForYou app (iOS, Android and BlackBerry), book directly with your Smartphone. Search from among the Première Classe Hotels in Agen.